The Return and Recover Mission – Run. Ride. Roam. This was accompanied by some frantic rummaging through panniers to discover that the blue coat was not with us, but was indeed still hanging in the room in Bologna. So after our long, hilly ride, Steve set off down the road to the factory outlet complex to look for a replacement that would do for the wet weather we were facing the next day. After much looking, with no success, largely due to the price tags being upwards of €300, including one that was €350 marked down from €999, he stumbled upon a cheapish one at a motorbike store, which would do the job for the ride to Florence. This still left us with the task of somehow retrieving the blue coat from Bologna, after emails to the hotel had failed to get a response. When we arrived at our current hotel, Steve tried ringing the hotel in Bologna, but the language barrier was proving a challenge, so he enlisted the help of the friendly girl at our reception, who made the phone call and all was sorted, with the blue coat having been found and was waiting at reception in Bologna to be collected. The mission for today was to return to Bologna and retrieve Big Blue, the companion of Ira and much needed member of our touring team. With train timetables consulted, we set off after breakfast for the walk of a couple of kilometres, to the nearest train station. When we arrived, it was to discover that it was another station without staff, so no way to purchase a ticket. Enter the translation app once again. When we got on the train, we typed our explanation into the smartphone and when the ticket collector came to ask for tickets, we showed him our explanation in Italian, he was completely understanding and helpful and there and then, with no further ado, our tickets were purchased from this nice man. We were on our way to Bologna. We’re comin’ for ya Big Blue, we’re comin’! 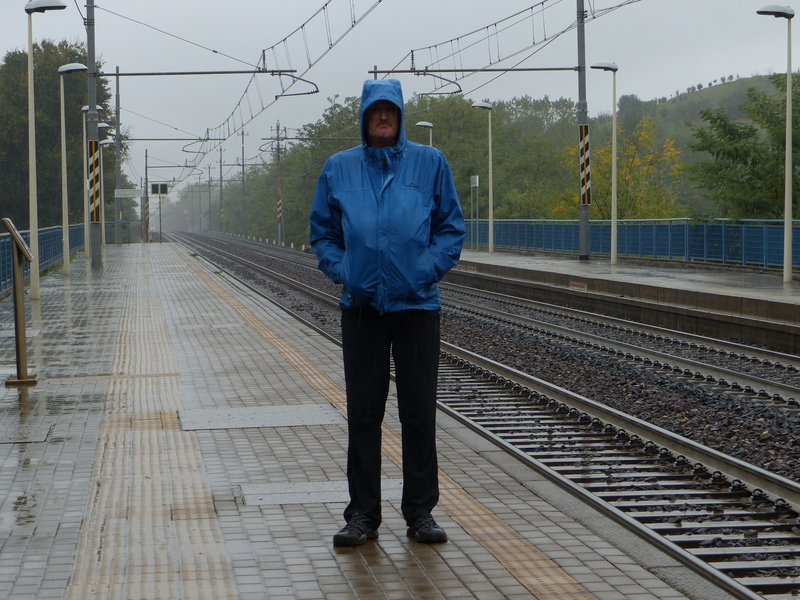 When we arrived at Bologna Central Station it was to…surprise, surprise…pouring rain! It was bucketing down again. We looked at options for how to get from the station to the hotel and found there was another train that would take us within striking distance, but included a 1.7km walk at the other end. Oh well, maybe it won’t be raining out there. We bought our ticket, hopped aboard and choofed a little closer to Big Blue. Our station appeared, we alighted from the train, into the still bucketing downpour. Off we set, for the walk to the hotel, along a dirt track, then onto a narrow path beside the main road, with the cars sending up spray beside us and the clouds determined to drench us from above. We squelched along and finally arrived at the hotel and, for the second time at this establishment, entered as soggy, dripping drowned rats! But, Big Blue was there, neatly folded and packaged into plastic and…mission accomplished! The blue coat had been recovered! Before making the return journey, we took a short, soggy, walk down the road to the shopping centre to have something to eat, prepare for the wet walk ahead and then we set off into the relentless rain. Back along the narrow path by the busy road we trudged. The rain had now created large lakes, creeping out from the gutter and onto the road and you can guess what happened…yep, waterfalls sprayed us. Most drivers did their best to avoid the lake, but three just drove right through it, right beside me, sending a wave of water my way and I got soaked from the side, as well as from everywhere else. Thanks for that! When we made it back to the station and set about buying tickets from the machine, we found that the next available train to our station wasn’t for another four hours, so instead we had to take a train down to Florence, then change trains and come back up, to get to the station near our hotel. So that’s what we did. We rode the train back to Bologna, got off, got on another train, rode that to Florence, got off, got on another train and rode back to Calenzano. Isn’t that gorgeous! Drop someone off, give them a kiss goodbye and off they go to ride their train! 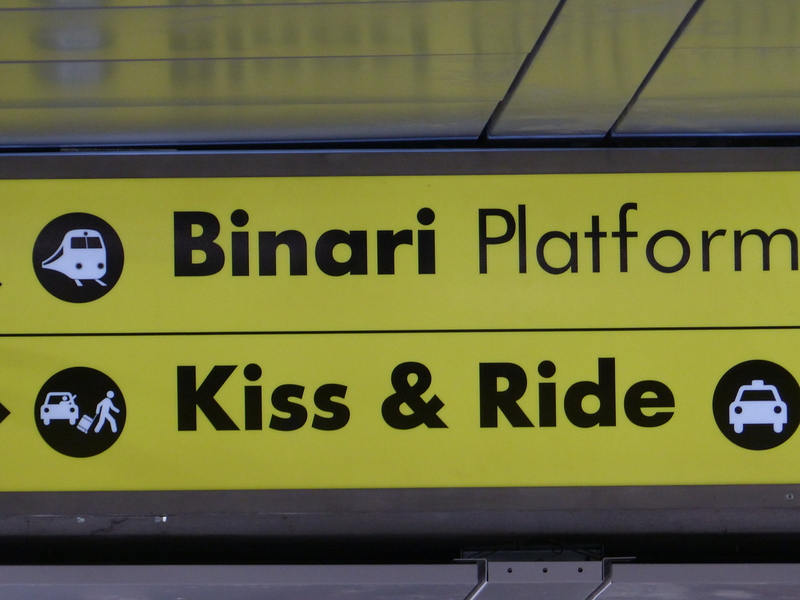 I’m not quite sure what’s involved if you’re travelling alone, but I loved seeing ‘Kiss and Ride’ signs all over the place, with the little symbol of someone in the car waving goodbye, while another person dashes off to catch their train. Very cute! After a full day of travelling, we finally arrived back at our station at 4:30, tired, hungry and quite damp and then set off walking back to our hotel, through the puddles and lakes on the roads once again. We were back, we’d made it, mission accomplished! We can now ride on, rain or shine, with Big Blue back in the fold and ready for action when called upon to do his duty, on the next wet and wooly day. So, no riding today. Well, no riding of bikes anyway, just riding of trains unfortunately. Tomorrow we will ride on, into the centre of Florence, where we will spend some time roaming and exploring. We had yet another day in the rain today, so hopefully, hopefully, we will get to see Firenze in her finery, rather than her drab, grey cape. She can leave that in the cupboard and wear her shining, beautiful best instead, we’d love to see that. But, if the wretched rain returns, no bother because our team is now back together and we have our support crew in the wings, waiting to leap into action and protect us from the precipitation as best they can. Big Blue and Ira are the unsung heroes of the trip, the hard workers, the crew members who take one for the team over and over again. Insert applause here…round of applause to you pair of brilliant blue superstars…round of applause!